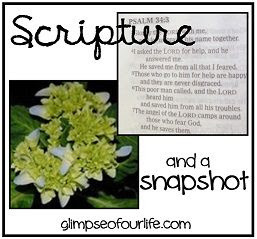 weekly scripture and snapshot post. Immediately, when I saw the word infuse, I thought of the image of a cup of tea. The water becomes infused with tea and becomes tea with the help of a little time and a little heat. I meditated on God infusing me with His strength. I understood that spending time with Him is essential to being infused with inner strength. When I thought of the heat, I instantly thought about how they say trials make us stronger. Yes, I do believe God uses the heat of trials in our life for good and that trials can make us either better or bitter. The choice of which we become is up to us. But, I felt God speak to my heart that this is not the type of heat that He was speaking to me about. He spoke to my heart that in order to be infused with His strength we must take time exposing our cold hearts to the warmth of His Word and the fire of His all consuming love. In my quiet time each day, I'm reading shorter portions of scripture, but meditating upon them more. I'm worshipping along with some of my favorite worship music and soaking in God's presence and love. I want to be ready for anything and equal to anything through Him. I want to be infused with His strength. I just happened across your blog which is filled with beautiful words..I read back about your mother, how sad for you but mixed with wonderful feelings of happiness for her, free from her earthly form. My mother never had white hair because she died when I was two, aged 26.. from TB, the disease that today is cured with antibiotics. I was brought up by my grand mother and two maiden aunts and saw my father now and then. He remarried but came back into my life when I was older. This year once again, on the weekend before Easter weekend, I travel over 200 miles to put flowers on my mother's grave and weep for her, the mother I never knew. What sweet thoughts! And a lovely pairing of image and words too :-) We forget how simple it can be don't we? Thank goodness that He does not! Elizabeth, what you've written about it resounding in my heart, as well! What a beautiful example of God's infusing us like the way "plain" water is made into delicious tea. I needed to read this today. You're a blessing to me. :) Thank you! Also, loving the photo you took...so sweet how you have the tea in your china tea cup and saucer with pretties around. I'm so glad it's also the small things such as that to remind you of the Lord! Nice!! I love how you compared infuse to tea. Brings around another view to the heat concept. 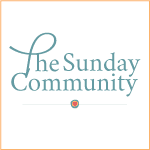 Thank you "SO MUCH " for these words,after eight months of being out of the blog world and doing some soul searching,it's so refreshing to come back to reading your encouraging words. Welcome back to the blogosphere. I'm so grateful that something I wrote was helpful to you. Thank you for your words today - they were just what I needed. Oh, to be so infused with HIM that no one see me any more! Recently I enjoyed just such a setting, tea served in the formal china, to a dear friend. The sharing strengthened us both as we felt His Spirit's presence. Excellent word pictures! Thanks for sharing, Elizabeth. Infused with his strength... that is so good. I am coming here from Still Saturday. This is a favorite verse of mine, but I hadn't read this translation. Thank you for sharing. 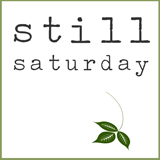 I'm also changing my quiet time up - talking less and trying to listen a bit more while pursuing stillness. "Infused with His strength" It is good to meditate and be mindful of God's provision and desire for us. Thank-you for the photo and inspiration. To be infused with His strength. Yes, my friend. That's what I want. I too have been reading smaller portions of scripture, trying to soak them in. Have a lovely Sunday! Oh, your meditations are just beautiful on the infusion of God's grace upon our lives. Very encouraging today! Saw your comment and came over to meet you. Saw your post about missing your mom and it was such a blessing to me. My mother passed away just a few weeks ago. She was also 85. I've thought so much about what the moment was like when she saw Jesus face to face. I miss her so terribly and your comforting words were what I took to bed with me last night. God bless you and God bless me as we miss our mothers and rejoice everyday that they are with Him. 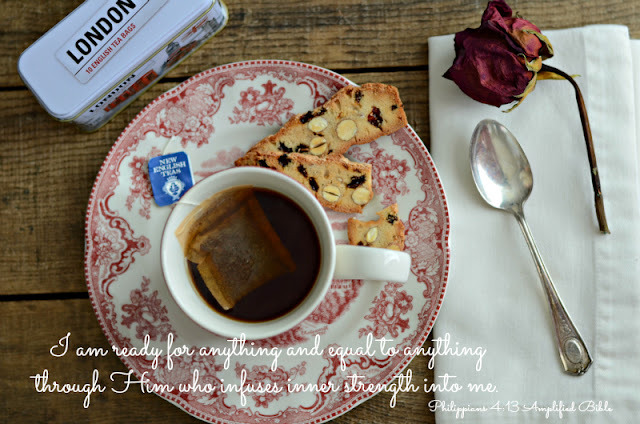 What a clear analogy-- inner strength infused from God like tea from a tea bag. I love that version of this verse, Elizabeth, and the encouragement to soak longer in shorter sections of His word, worship, His very presence. Thank you for this encouragement today. How I need the strength that comes from being soaked in Him. I don't think I've seen that verse translated that way before, but I love the thoughts about God's strength being infused in us. Thank you for sharing such an encouraging word! I appreciate your encouragement, Kim. ...infuses inner strength...great thoughts for meditation, thank you! Hey lady, did you get my email? Just need to know if that will work for you. Hope to hear from you soon! I didn't get an email. What's up, my friend? Oh, it's wonderful to find your lovely site today! I related to what you wrote. I've only just begin to read the Bible and I'm trying to find my footing for quiet time with Him. I love how you wrote He's bringing us His warmth to infuse into our cold hearts. So, so true.